Whether to add functionality or purely decorative, garden bridges make a stunning feature, which definitely becomes the focal point of the space. The obvious purpose of building a garden bridge is to provide passage over ponds, streams, or lakes. However, it doesn’t necessarily mean that you need any water feature to build a bridge, it can be added just to enhance the look of the garden. Actually, even a simple, small wood bridge can definitely transform any outdoor space from boring to fabulous one. Furthermore, any kind of bridge is an eye-grabbing sculptural addition, which brings in visual interest and character. So, if planning to renovate your outdoors, consider incorporating a garden bridge. With an array of options available on the market, it won’t be difficult to choose a design solution that best serves your needs and taste. Note that they should complement the style of the house and the landscape, though. Of course, you can always opt for a custom-made bridge, which will make your outdoor space unique. If you still hesitate, these stunning designs can help make up your mind! When it comes to garden bridges, wood ones are a common option. A smart idea is to choose a durable type of wood that weathers beautifully over time. Whether large or small, with or without railings, traditional arched ones or contemporary-style flat bridges, they can definitely lend an inviting, classic look and touches of uniqueness to any outdoor space. Note that no garden is too small for building a bridge, just on the contrary, even the tiniest yard can benefit from adding a bridge. Above, a bridge over an artificial stream with river rocks. This small design without railings is used as a décor element. Its light color perfectly complements the look of the garden. LED lights add functionality and extra visual interest. Definitely a delightful space! Generally, always consider adding LED lighting to create a truly whimsical setting for family gatherings or parties with friends. Also, ornate railings are a fabulous way to enhance the look of the space. 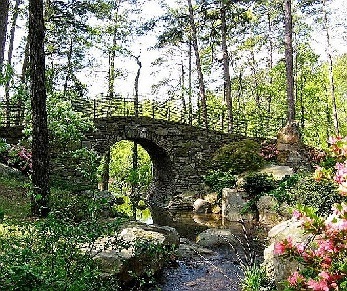 When it comes to garden bridges, Japanese-style ones with their easily recognizable arched design are extremely popular. Sometimes, longer bridges can have several arches instead of a single long one and this gives them a definitely unique shape. 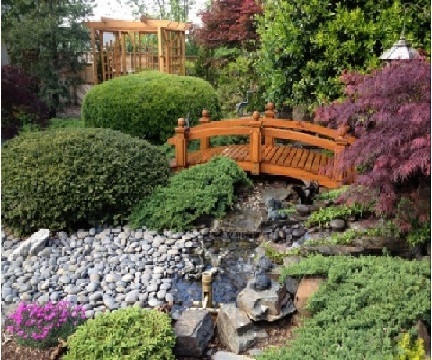 In the picture above, a Japanese-style bridge across a small creek definitely stands out in this garden with a distinctive Asian vibe. Lush greenery and eye-grabbing rockwork complete the look of the space. 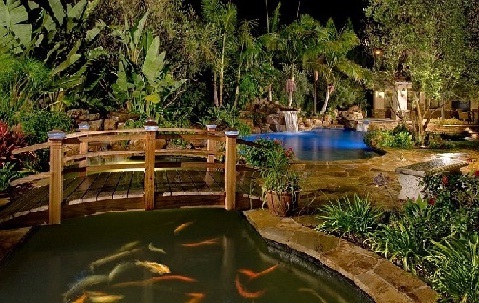 However, these attractive bridges can be incorporated even in contemporary or rustic garden landscapes, especially when combined with a koi pond and vibrant scenery. Above, an arched Japanese-style bridge over a koi pond. Note the lighting in the bridge posts. 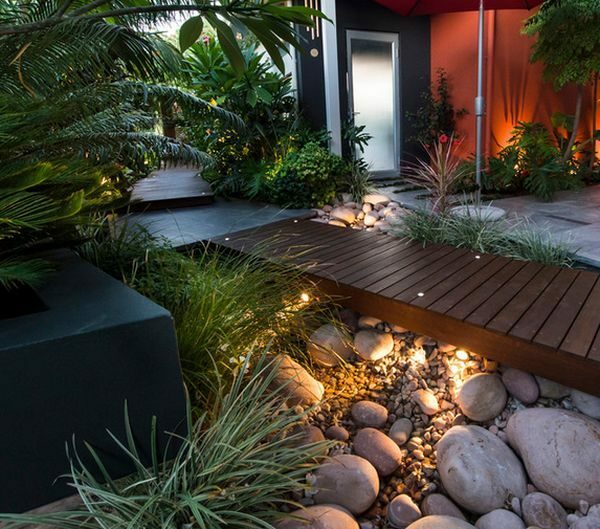 Lush greenery, waterfalls, and a smart lighting scheme definitely create a fascinating outdoor space! Suspension-style bridges are another option, especially when used over deeper water features. These bridges add touches of unexpectedness, architectural character, and visual interest and usually turn into a striking garden décor element. 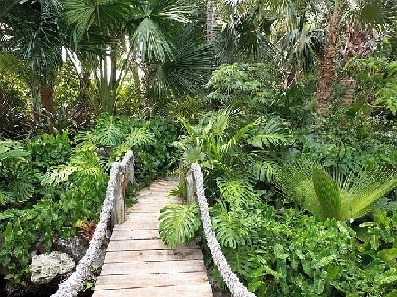 Above, a suspension-style bridge in a tropical garden. Rope railings for extra visual interest complete the look of the bridge. Lush greenery creates a sense of drama and adds lots of texture. Compared with traditional garden bridges, contemporary ones are flat, they don’t have that recognizable arched shape. Otherwise, in terms of functionality and décor, their use is just the same, the difference is only in the style. As with traditional garden bridges, for adding visual interest, charm, drama, and romance, accent lighting can be used. For larger ponds, flat zigzagging garden bridge designs definitely work well both in terms of functionality and aesthetics. In the above-shown picture, a contemporary-style bridge across a stylized dry riverbed of rounded stones of various sizes. Greenery adds to the organic feel and helps soften the look of the stones. Smart lighting brings in an extra dose of visual appeal. Rocks and pebbles are also used as a lawn edging. If you want to turn your garden bridge into a dazzling focal point, then, choose a painted option, it is a surefire way to make it instantly stand out. 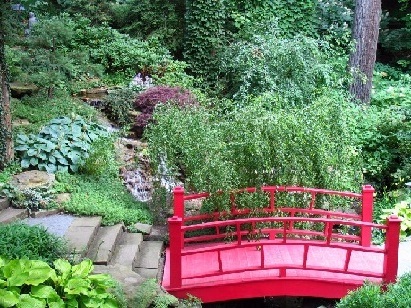 Above, a bridge with railings for safety and aesthetic reasons in bold Chinese red definitely makes a statement in this garden. Although not so popular, stone options are as functional and attractive as their wood equivalent. Just imagine the timeless, delightful look of a traditional English garden! A weathered stone bridge over a shallow creek, mossy rocks, benches, birdbaths, lush vegetation…Definitely a feast for the senses! Unquestionably, such a setting with Old-world charm that can leave anyone spellbound! Above, an arched stone bridge with metal railings adds functionality, architectural character, and personality to this picture-perfect garden spot! However, stone bridges with simpler design can be incorporated in Zen gardens, in small urban gardens as well as in contemporary gardens. In such gardens, slab stone bridges work well adding extra textural and structural beauty and visual interest. Note that using slab stones to build a garden bridge is an easy, affordable option to enhance the look of any outdoor space. Above, a thick, flat slab is the perfect choice for a foot bridge for this natural pond complemented by rocks of different shape, size, and color. 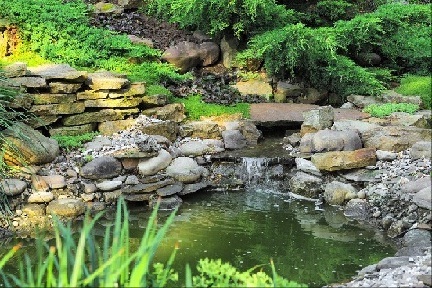 A lovely small waterfall creates a sense of movement. Lush greenery completes the look of this delightful garden spot. For extra doses of visual interest and personality, opt for custom bridges. Thus, a combination of a stone bridge and wood railings, especially ornate ones, definitely makes a statement garden element. You can go a step further and use any kind of exotic woods to create a unique garden bridge. Note that a stone base works well with wrought iron railings instead of wood ones. Unquestionably, wood and stone bridge designs are the most popular ones. 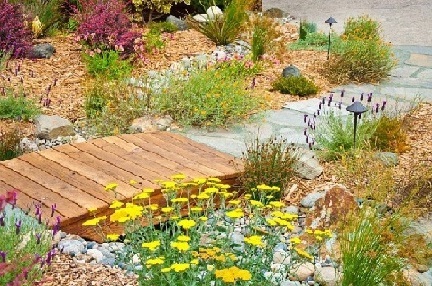 However, in terms of materials and combinations of materials, other options can also make unique garden accents, such as metal bridges. Metal garden bridges come in different sizes and styles. With a flat or arched platform, they offer durability and stability and especially when complemented by ornate railings are an attractive garden feature. Above, a stunning sturdy, green wrought iron and wood arched bridge over a small artificial water feature perfectly complements this country-style garden. Lovely flowers and bushes add color, scent, and charm to the setting. When it comes to metal, note that a wood bridge can also benefit from delicate metal decorations on the railings. As a side note, when an arched bridge spans over a manmade water feature, hanging baskets with trailing vines positioned on the railings make an eye-grabbing décor, which helps seamlessly blend natural and artificial garden elements. 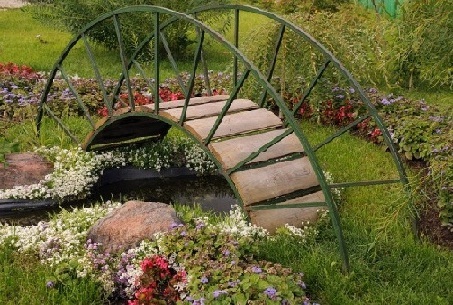 Coming in an array of forms and designs, made of different materials, garden bridges can be placed virtually anywhere. Whether used for practical reasons to provide passage across a water feature or as a décor element, they are a spectacular addition to any outdoor space. Furthermore, they offer a surefire way to lend any outdoor space a fascinating, fairytale look. 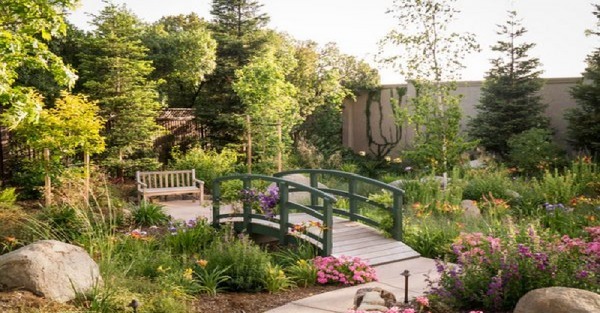 Adding visual interest, charm, touches of whimsy, dimension, and architectural character, garden bridges work well with water features, gazebos, pathways, and flower beds and definitely grab and keep attention. Do you have a garden bridge? If you don’t have, are you going to consider adding one to take your garden to a whole new level?